The title of this post is somewhat misleading as I’m not actually sharing how to programmatically populate a WordPress template – instead, I’m walking through the process of populating a page that also has a page template applied to it. Back in March, I shared a proof-of-concept plugin for including a template file in a plugin. If you browse through the comments, note that there’s a lot of discussion on how to do it, why one way is better than the others, and so on. But as I’ve continued to work on a project in which I include templates in plugins, I’ve also been working on populating template-based pages with content from HTML files. Here’s how I’ve been working to programmatically populate a WordPress template. The strategy behind this process is simple: I want to give end-users who are good with front-end development an easy way to provide content to prefill a template. Specifically, I’m bundling HTML files with the plugin that users can edit that will be used to then prefill the content of the template-based pages upon plugin activation. 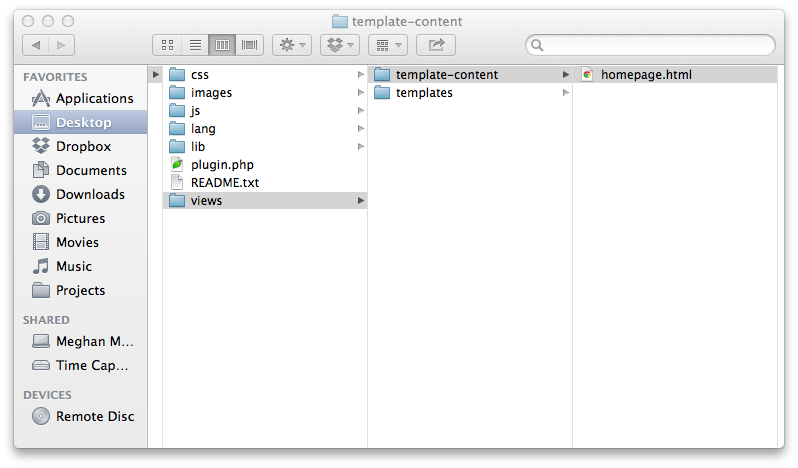 In the plugin directory, I include a views directory that also includes a template-content directory. I then create an HTML file that corresponds to its template name. In the screenshot above, you see an HTML file named homepage.html that will be used to populate the page that’s given the homepage template upon plugin activation. This particular step is somewhat subjective as implementations will vary; however, in my case, I’m primarily interested in setting the page’s title and the page’s content based on the content in the HTML file. And then use a regular expression to parse the content. I’m using wp_remote_get as my function for retrieving the content file. This is the preferred method for retrieving content (though file_get_contents or curl may work, if they’re enabled on your server). I’m using two regular expressions that should be easy enough to follow. Note that I’m using the zero-th index of the first index of the returned multi-dimensional array. This ensures that we’re reading only the content of the markup. Other indexes of the array will return the full content – including, for example, the body tag – of the file. After that, it’s a simple matter of programmatically creating the post. This particular step is very similar to programmatically creating a page in WordPress except we’ll be using a different post type and we’ll be setting the page’s meta data to also include the template. After that, we need to set the post meta data so that the proper template is applied. In our case, this will be the homepage.php template that’s included with the plugin. And that should take care of everything. Depending on where you implement this code, this can happen upon plugin activation, when a user opts to trigger this behavior, or at some other entry point or event in the WordPress page lifecycle. Finally, this may look a little contrived – after all, why not just provide a title when creating the page, right? In the method provided above, you could easily substitute, say, the title with some information to that’s used to populate post meta data for the given post.